Forget about buffalo wings, these crispy baked buffalo chicken legs are the perfect crowd-pleasing game day food for football season. If you know me this probably won’t come as a surprise, but Buffalo chicken wings are one of my favourite, guilty-pleasure foods. Everyone knows that they are my go-to order when we go for wings or trivia night. I mean, it’s pretty hard to resist the combination of chicken, a vinegar-based hot sauce (like Frank’s hot sauce) and butter. So, why not try using chicken drumsticks with the same flavours? These crispy baked buffalo chicken legs are 100% irresistible and perfect for watching the big football game. Are you busy planning your Superbowl party? I mean, it’s coming up pretty quickly and I’ve noticed that people are looking for all sorts of game day food. My healthier cheesy broccoli dip is a great vegetarian option for a party. 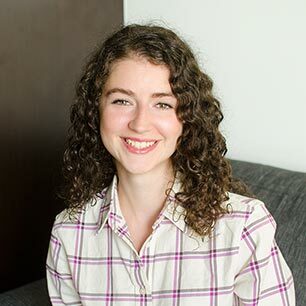 Keeping dietary restrictions in mind when entertaining is really important, that way everyone has something they can eat. How do you make crispy drumsticks in the oven? To get a crispy skin, toss the chicken drumsticks in olive oil and roast at 475F for 40 minutes. I’ve used the method to roast chicken legs for a couple of years, and it never fails to perfectly crisp up the skin that mirrors the crunch you get from frying, but without all of the mess. 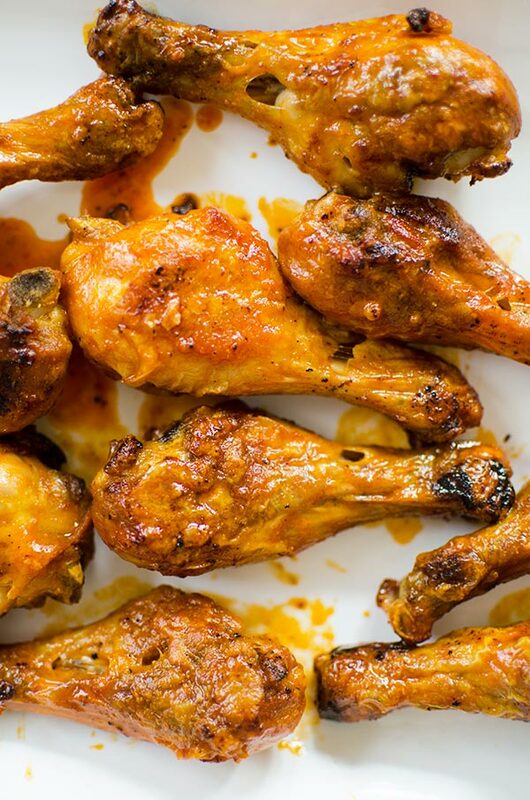 How do you make a homemade Buffalo sauce for chicken drumsticks? Honestly, Buffalo sauce couldn’t be easier! For this recipe, you use a ratio of 1 part butter to two parts hot sauce. For Buffalo sauce, you want to use a vinegar-based hot sauce like Frank’s. Just before the drumsticks are done, I’ll melt some butter on the stovetop and toss the hot chicken drumettes in the sauce just before servings. This helps to preserve that irresistible crispy skin. This recipe makes 12 chicken legs, but for feeding a crowd it can easily be doubled or even tripled. The buffalo wing flavours fall more on the medium side than the hot and spicy side, but if you’re a fan of extra hot, just switch up the ratios of hot sauce to butter and add a little more hot sauce. That’s one of the ways restaurants make mild, medium and hot wings — it’s all in the ratios of butter to hot sauce. How to make spicy Buffalo chicken legs? To make this Buffalo chicken more on the spicier side, toss the drumsticks with about 1/4 tsp of cayenne pepper along with the olive oil and garlic powder before roasting them. Crispy baked buffalo chicken legs are roasted in the oven at 475F and then tossed in a homemade Buffalo sauce for an easy game day recipe. In a large bowl, toss chicken with garlic powder, salt and olive oil. Place on a baking sheet and roast for 40 minutes, flipping halfway through. In a small pot, melt butter with hot sauce. In a large bowl, toss cooked chicken with buffalo sauce and serve. 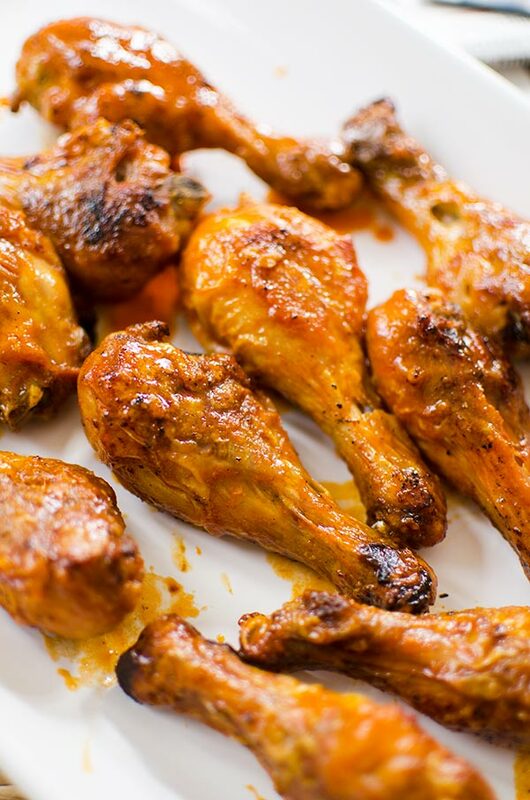 If you want to change it up and try some more exotic flavours, I have a recipe for Indian-spiced chicken legs which will also become a favourite, but for something more tradition you really can’t go wrong with my baked buffalo chicken legs. Let me know if you give this recipe for baked buffalo chicken legs a try in the comments below. Don't know if I just have a super oven or what but even the first 20 minutes at 475 was way too much. They were burned slightly and my fire alarms were having a party. Would love to try again, maybe a lower heat + longer time! Hi Zelma, I'm so happy to hear that you enjoyed this recipe, thanks for letting me know! Let me know if you try it out on wings as well. Thanks for posting this! I tried it with chicken thighs and it turned out well. The chicken thighs I had were extra large so I had to cook longer. The pan drippings did smoke at the end - probably because I took some of the drippings out partway through so that they wouldn't spill out when I was moving the pan. Next time I'll use a pan with higher edges so I can leave the pan drippings in and then it won't burn in the empty pan spots. The recipe flavors were delicious! Thanks again! Made these tonight! They were absolutely delicious! Will definitely make them again! Thanks Anne, glad you liked them! Hope you enjoyed them Meagan! I just made them and they are really good thank you for sharing the recipe!!!!!!!! Thanks Trinity, so glad that you liked them! I am picking up some chicken wings for my dinner tonight & I will be making this recipe as it sounds soooo tasty!!! Mmmm! I hope you enjoyed, xo! SO YUMMY. Cooking time in my oven varied slightly but I just kept an eye on them and ended up lowing the temp just a bit halfway through. I also put a little bit of cajun seasoning on the drumsticks before cooking them. Me and my husband were so sad I didn't make more. Definitely going to use this recipe again. Thanks!! So glad you and your husband enjoyed these Jessica, love the addition of the Cajun seasoning! Delicious! I also added a few tablespoons of hot pepper jelly to the franks/butter! So glad that you enjoyed them, love the idea of adding hot pepper jelly!